This session was about how one school is moving to blended learning approaches, and the shifts in teaching and structures required to make that happen. They focused on the changed role of the teacher and the new ‘architecture’ needed. This approach is a team based one, and the Principal questioned the importance of the teacher in the future. 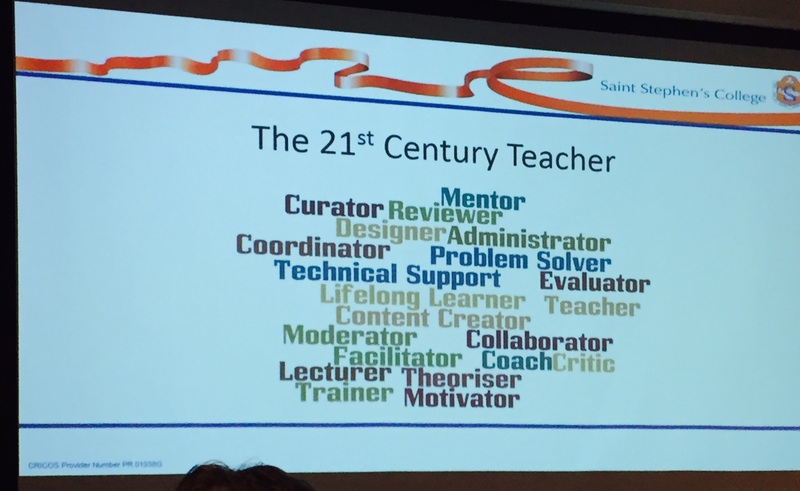 The session explored the role of the 21c teacher in pretty familiar ways really. They explained their approach to blended learning, the teacher guiding the students through understanding and checking for understanding. 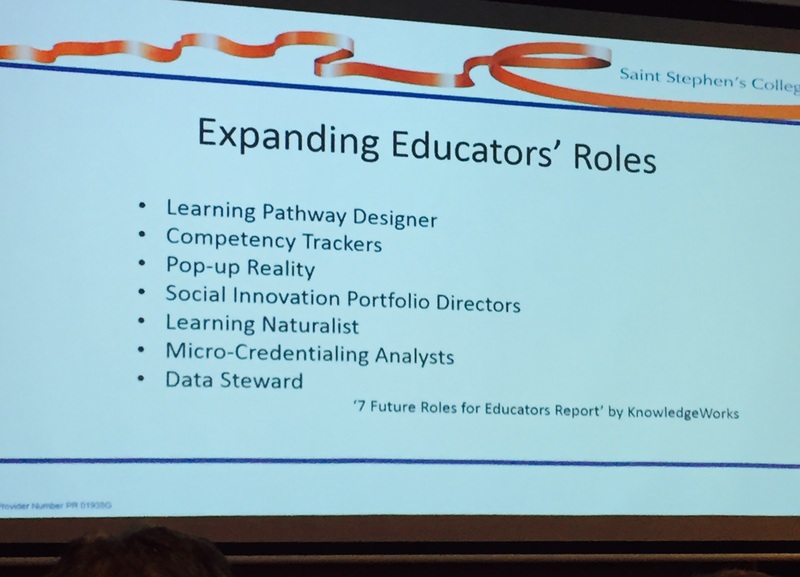 They talked of a KnowledgeWorks article: 7 future roles for educators including ‘data steward’ and ‘micro-credentialing analysts! 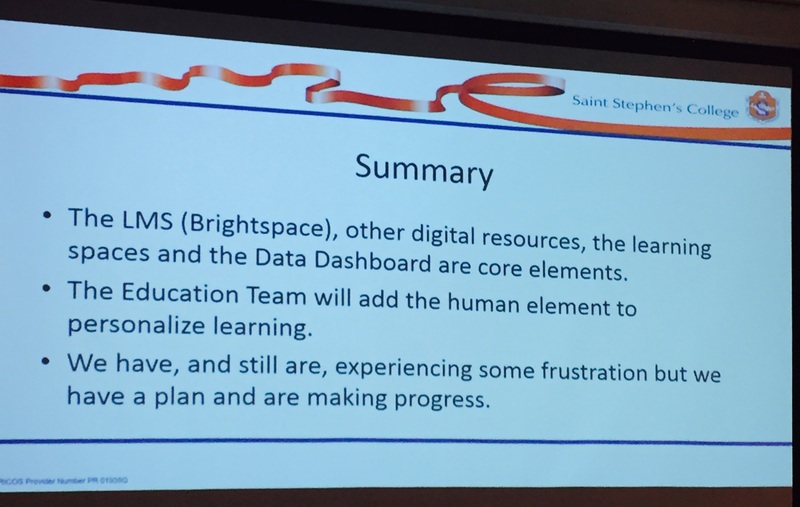 They are working on a data dashboard with Independent Schools Qld. They also appointed a learning coach, targeted using data and said that the roles were definitely increasing. Interestingly, their students were required to enrol in a MOOC. They also talked about their LMS, their development of a robust network as the bedrock for the journey and their choice of BrightSpace. it was interesting to hear about the way they gradually moved the conversation towards blended learning and responding to the Netflix generation, evidenced in weekend and after hours ‘when they want to learn. They argued for the self-paced benefits of blended approaches. The last one can make teachers uncomfortable but you can do the first two without making any change at all. Finally, they made a good case for their Academic Advisor program, which they’re expanding, partly based on the parent feedback. Finally, they talked a little about physical architecture, their LOTE building, the Team Projects Area, the Arts and Applied Technology Precinct, I-Centre and ‘Science in Action’ building. They see a future with fewer teachers and less classroom time. it was a good session presented by a passionate team. 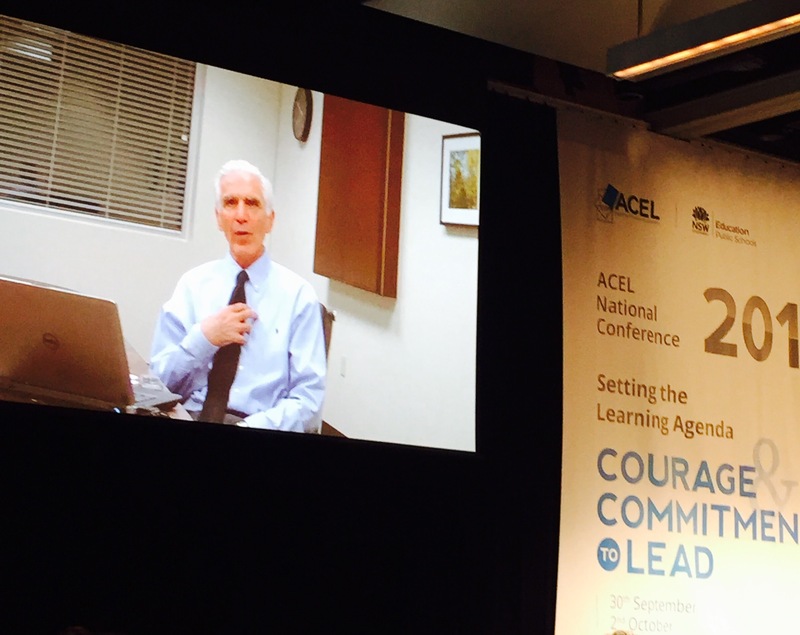 Marzano talked about his model for school reform -for creating high reliability schools. He talked of four systems. Knowledge – we spend most of our time in schools in this domain. Marzano argued that we spend too much time on the knowledge systems. 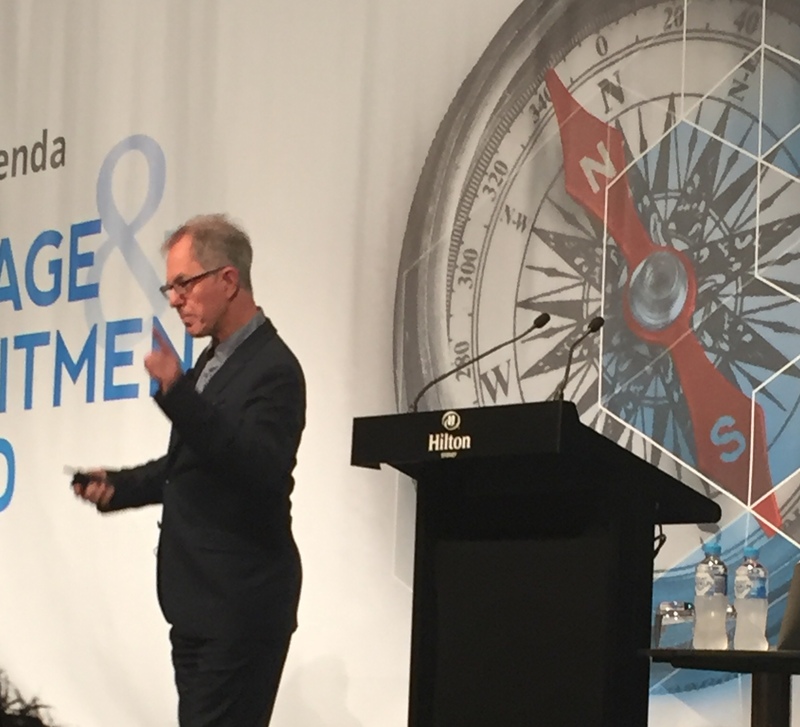 He talked about leading and lagging indicators, monitoring and celebrating success using quick conversations, quick observations and easy to collect quick data. He had developed indicators for levels and shared some critical indicators for each. – A focused curriculum that can be achieved in the time available . It was a interesting session, a little US centric and a little marred by it being a Skyped in Marzano we were getting, which broke up a little at times. First world problems! Just 28 per cent of state schoolteachers are men, down from 32 per cent 10 years ago. The full article, arguing that the the decline in male teachers in schools has contributed to rising youth violence, is HERE.